Summary: We have the best economic recovery that a trillion dollars per year of Federal borrowing can produce, with enthusastic cheering from Wall Street. Some people look at the data and believe the great boom has begun. Some look at the data and see a patient on life-support, slowly fading away. We’re off the map of conventional economic theory, so read this and judge for yourself. What’s maintaining enthusiasm about our economy? Rising treasury yields (eg, ten year is up almost 1/2 point since January). Watch this closely! The Fed must keep a lid on long rates. Brent spot oil prices recent low was December 19 at $102; it’s now $125 (up 23%) — a serious drag on global economy. Flash Germany Manufacturing PMI at 48.1 (50.2 in February), 4-month low. Incoming new business fell for the eighth successive month, deteriorating at the fastest rate since December. Renewed declines in France and Germany were accompanied by a sharper rate of contraction elsewhere (on average). The rate of decline of new orders also exceeded that for output, causing backlogs of work to fall for the ninth successive month. This is likely to put further downward pressure on output levels in April. 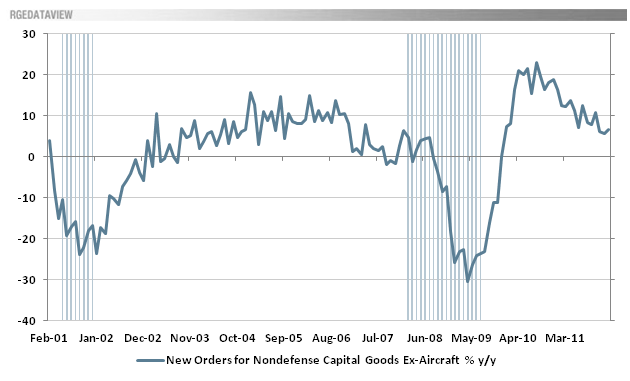 New orders fell at the fastest rate for three months in both manufacturing and services. Goods producers reported the steeper rate of decline, as falling domestic demand was exacerbated by a ninth consecutive monthly drop in new export orders. March data pointed to a slight reduction in new business received by private sector companies in Germany. This renewed contraction in client demand means that total new work has now fallen in seven of the past eight months. The overall reduction was driven by a solid drop in manufacturing new orders, whereas service providers noted a modest expansion in March. Manufacturers also reported a sharp and accelerated decline in new export business, suggesting that softer global trade flows had been a key factor behind the latest fall in new work. Manufacturers noted a drop in new orders for the ninth consecutive month, and at the sharpest rate since last November. Domestic demand appeared to be the main area of weakness, as new export orders increased slightly for the second month running. In the service sector, growth of new business eased to near-stagnation. Weakening domestic demand continued to weigh on growth, as indicated by a slowdown in new orders which came in at a four-month low. External demand remained in contraction territory, but the decline was at a slower pace, implying that there are no improvements in the demand outlook. More worryingly, employment recorded a new low since March 2009, suggesting slowing manufacturing production was hindering enterprises’ hiring desire. The soft-patch in manufacturing was in line with the recent downside surprise in industrial production growth. 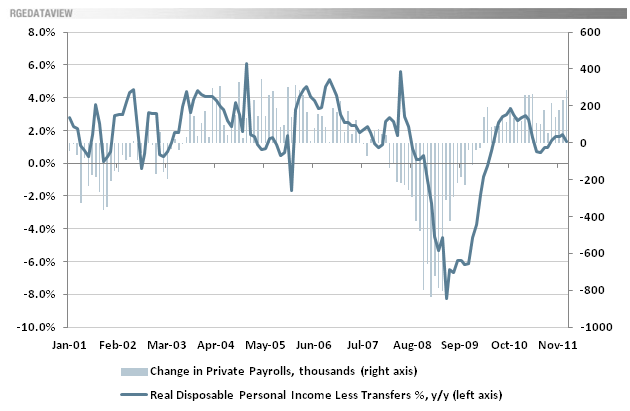 Some people believe this is a strong dimension of the US recovery. The data suggests otherwise. It’s a weak recovery, at best. Seasonal adjustments are necessary to interpret short-term trends. But the 2008-2009 crash and bounce introduced distortions into the SA formula, which use recent history to adjust the current numbers. Also, the US had almost no winter this year (see the NOAA data here). These formulas assume a winter downturn, and adjust up accordingly. Accordingly they boosted the numbers for a winter downturn that did not occur. 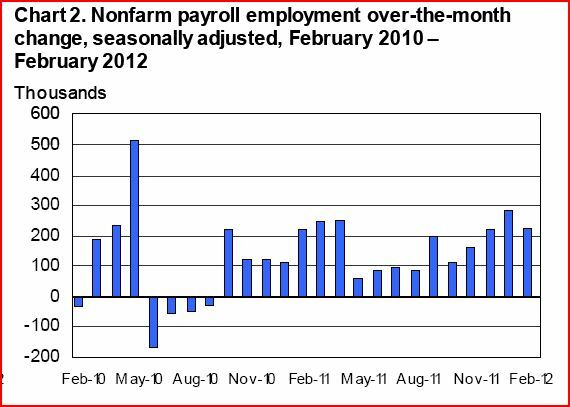 Here’s one example, from Table B-1 of the February employment report. Going from negative to positive is a common adjustment, but might not be appropriate now given the light winter. The employment-to-population ratio displays a classic V-shape recession and recovery pattern in the 1970s and 1980s. In the recession and recovery of the early 1990s, however, the employment-to-population ratio instead displays a U shape, only returning to its pre-recession level three years after the peak in the unemployment rate. In the recession and recovery of the early 2000s, neither the participation rate nor the employment-to-population ratio returns to its previous level, so we see an incomplete U-shape pattern. In the most recent cycle, the employment-to-population ratio traces out an L shape, but the unemployment rate falls because the participation rate declines substantially … in other words, a larger share of the population is out of the labor force rather than participating and being unemployed. See these two thought-provoking graphs from Roubini Global Economics report of 23 March 2012 (gated), using data from the FRED system of the Federal Reserve Bank of St. Louis. (5) What’s maintaining enthusiasm about our economy? Perhaps the expectations of additional monetary stimulus from central banks in the US, EU, and China. None of these look certain, or even likely in the next 2 or 3 quarters, unless the economy slips into recession. China is attempting to cool an overheated economy. Many experts consider stimulus unlikely before the leadership change in October. The ECB has just completed a massive (and controversial) monetary injection (two rounds of LTRO, expanding their balance sheet with weak assets). See ECB Balance Sheet Hits Record $3.9 Trillion on History-Making Bank Loans at Bloomberg. Another round of Fed stimulus (QE3) probably would have little economic effect, servicing only as a politically divisive stimulus to markets before the election. Monetary stimulus works largely by stimulating credit growth. That has not happened in this cycle. Excluding Federal education loans, there has been steady contraction in Household credit (per the Fed’s G.19 report) since 2008. Business borrowing has expanded slightly during the past few quarters, following a large contraction during the 2007-2011 period. The outstanding student loan balance now stands at about $870 billion, surpassing the total credit card balance ($693 billion) and the total auto loan balance ($730 billion). With college enrollments increasing and the costs of attendance rising, this balance is expected to continue its upward trend. Further, unlike other types of household debt such as credit cards and auto loans, the student loan market is incredibly complex. … we find that as many as 47% of student loan borrowers appear to be in deferral or forbearance periods, and thus did not have to make payments as of third-quarter 2011. Specifically, 17.6% of borrowers had exactly the same balance in the third quarter as in the second quarter of this year, and 29.1% increased their overall student loan balance by taking on new originations or accruing interest to the balance. We then recalculate the proportion of borrowers with a past due balance excluding this group of borrowers. We find that 27% of the borrowers have past due balances, while the adjusted proportion of outstanding student loan balances that is delinquent is 21% – much higher than the unadjusted rates of 14.4% and 10%, respectively (see charts below). Massive fiscal and monetary stimulus has maintained slow growth since 2009. But like many powerful medicines, it’s poison if used at high doses too long. Not just unsustainable, but actively harmful. The medicine makes us feel good — which we mistakenly believe means we have regained our health. And so we ignore the two steps necessary for a real recovery. We may not have long to implement them — a few years, a few quarters, a few months? Use to opportunity to borrow at low rats and build at low cost to rebuild our rotting infrastructure. Prepare American to compete in the 21st century. Other nations do so while we play. Use the time bought by this medicine to make painful reforms (especially to the banking system). That’s how wise nations use recessions, as they make change politically possible for a brief time. 2 Responses to "A Status Report About the US Economy (We Party So Hard We Cannot Hear the Alarms Ringing)"
I found your economic data interesting and extensive. But I have yet to hear from anyone on the global effects of all these bilateral trade deals and some trilateral ones as well. My worry is that many of these trade deals focus on privatizing public services (most of which are paid and effect costs on debt levels and taxpayers). To my knowledge these deals do not increase domestic growth as far as small and medium sized businesses. At a multinational level there will naturally be no complaints but very little is said about the countries and their taxpayers affected. I am not ignoring the draining of natural resources or am I forgetting the will to see water valued as a commodity. Comments? The auto industry is buoyant but at the same time is not free of faults. Encouraging signs are new cars being bought while old and used cars via auto auction brisbane .